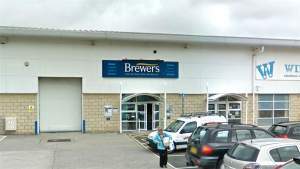 Inside, you’ll find a comprehensive range of trade paints, designer paints and wallpaper pattern books, along with online kiosks where you can browse and order from the entire Brewers range. We’re popular with both trade and retail customers and if you’re in need of product or application advice, you couldn’t be in safer hands. Our newest member of staff has 12 years’ industry experience and the others have racked up an impressive 95 years of trade knowledge between them. The Brewers Decorator Centre in Southsea is on Dickinson Road, off Fratton Way, part of the Pompey Centre. 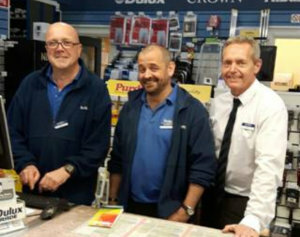 We’re known as Brewers Pompey– mainly to distinguish us from our other Portsmouth Decorator Centre on Waterworks Road. Being at the Pompey Centre, there’s masses of customer parking available directly outside the store and the chance to do plenty of other shopping while you’re here. Follow the signs for Portsmouth Football Club and we’re just along the road from there. Travelling along the A2030 take the first exit at the roundabout then go straight over the second roundabout, then take the first left onto Dickinson Road.